When you need a fast and easy dinner it has not to think of making a stir fry. It does not matter what type of protein you have on hand (or none at all if you want a nice vegetable stir fry), all you need is a good sauce to use and some vegetables and you are good to go. I have always found that sir fry dinners work really well with leftover vegetables much like it is when you want to make a hash. 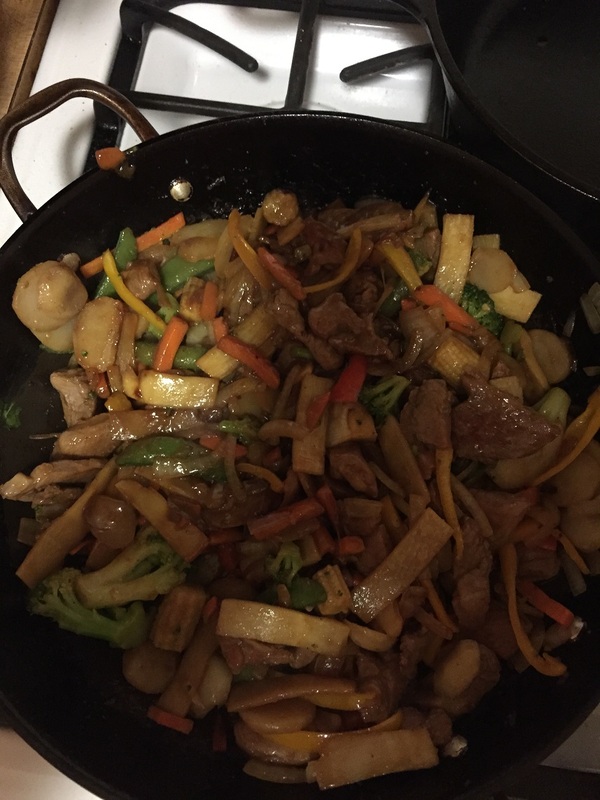 At any rate, since Mondays are hectic days around here (although lately they all seem pretty hectic), a stir fry was a very easy way to go for dinner that could be done quickly. I had a pork tenderloin on hand and decided this would be the perfect foil for a nice stir fry meal so I found this recipe at food.com for a simple pork teriyaki stir fry, rounded up my ingredients and went ahead with the recipe. In a medium bowl or large measuring cup, whisk together the soy sauce, brown sugar and cornstarch until the mixture is smooth and well blended. Add the ginger, garlic and red pepper flakes and whisk again to blend the ingredients. Cut the pork into thin strips and add it to the soy sauce mixture. Toss the pork to coat it well in the sauce and cover and refrigerate the pork for at least 15 minutes. Meanwhile, make the white or brown rice according to the package directions and set the rice aside. Heat 1/2 teaspoon of the sesame oil in a large skillet or wok over high heat until it is smoking. Remove the pork from the marinade and add the pork strips to the skillet, reserving the marinade for later. Stir fry the pork for 2 to 3 minutes until it is no longer pink. Remove the pork from the skillet with a slotted spoon to a bowl and cover the bowl to keep the pork warm. Add the remaining sesame oil to the skillet. Add the bell pepper, snow peas and green onions and stir fry the vegetables for 2 to 3 minutes until they are crisp-tender. Return the pork to the skillet with the vegetables and stir in the reserved marinade and the bamboo shoots. Bring the mixture to a boil and cook for 1 to 2 minutes or until the sauce has thickened. Remove the stir fry to a large bowl or platter and serve with the warm rice. Of course the great thing about a stir fry is that you can use any vegetables you have on hand. I had some multi-color peppers so I went with red, yellow and orange and I also had a pack of frozen stir fry vegetables on hand that I added to the vegetables at well to make it a full meal. the sauce was perfect for the pork and the vegetables and everything smelled great and tasted even better. As a matter of fact, there was very little left over from the meal, just enough for Michelle to take for lunch with her. it’s a fast one pot meal (well 2 with the rice) that you can have made in under 30 minutes for any night of the week. We haven’t really had a lot of cool weather here in my part of New York just yet, though it is starting to get there with some nights down in the thirties. in any event, once the fall rolls around I start to think more about soups, stews and slow cooker meals because they just make you feel warm, make the house smell great and are easy to put together for a one pot meal. 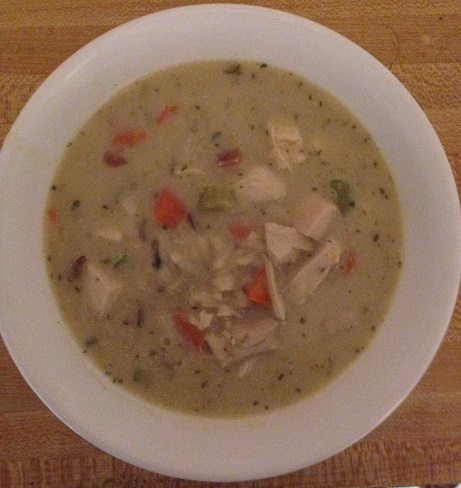 I decided I wanted to make something really easy and have a great soup and give some chicken and wild rice soup a try. This is a great options when you have some leftover chicken or a rotisserie chicken and want to do something different with it. There are lots of different types of wild rice that you can get, so you could always get your favorite quick version or get a regular version that takes longer to cook but seems to have better flavor, in my opinion. In either case, this turns out a very tasty soup for the whole family. I used this recipe from Food.com to make my soup when I did it, but the soup as a whole is pretty easy to put together on its own. In a saucepan set over medium heat, mix the chicken broth, sliced carrot, sliced celery, uncooked wild rice, leek or green onions, dried thyme and 1/4 teaspoon of black pepper. Bring the mixture to a boil then reduce the heat to low. Cover the saucepan and allow the mixture to simmer until the rice is tender, about 45 to 50 minutes. Meanwhile, melt the butter in a small saucepan set over medium heat. Stir in the flour and then stir in the half-and-half or milk. Cook and stir the mixture until it is bubbly, about 1 to 2 minutes. Slowly add the half-and-half mixture to the rice mixture, stirring constantly to thicken the soup. Stir in the chicken and the dry sherry. Heat the soup and until the chicken is heated through, about 3 to 4 minutes. Divide the soup evenly among soup bowls and if desired, garnish the soup with the carrot peel strips. This turned out to be a really great soup without a lot of work needed for it. You get great flavor from the wild rice and the stock thickens up nicely when you add the roux to it to make things even better, and the touch of dry sherry at the end really tops things off nicely. I could see adding different vegetables to this if you like, such as some broccoli or sliced mushrooms or really anything that you favor. The soup was even better the next day for lunch and we all really enjoyed the meal. I made some buttermilk biscuits to go along with the soup, but you could make any bread, rolls, biscuits or even just have crackers or a sandwich alongside of it and you have a great meal. We were all feeling kind of lazy yesterday. I normally cook a big meal on Sunday for dinner but I just didn’t feel up to it yesterday so we were looking for something simple. Sean actually suggested Margherita pizza, which I had not made before but it sounded like a good idea so I decided to go for it. I looked around for a good recipe and I found this simple one online at Food.com so I decided to go with this one. Preheat the oven to 450 degrees. Drizzle the olive oil over the pizza crust. Use a brush to spread it around evenly to make sure it covers all of the crust. Disperse the finely chopped garlic evenly over the crust. Spread the mozzarella cheese throughout the top of the crust, trying to keep the layers of cheese as thin as possible. Place the thinly sliced tomatoes across the entire pizza. Lightly salt and pepper the tomatoes. Spread the fresh basil leaves over the pizza crust, making sure to cover some of the tomatoes and some on just the cheese itself. Cook the pizza in the oven for 10 to 12 minutes or until crispy and the cheese is melted to your specific liking. Add the Parmesan cheese and crushed red pepper, if using. Slice and serve. Just a few things about this recipe. 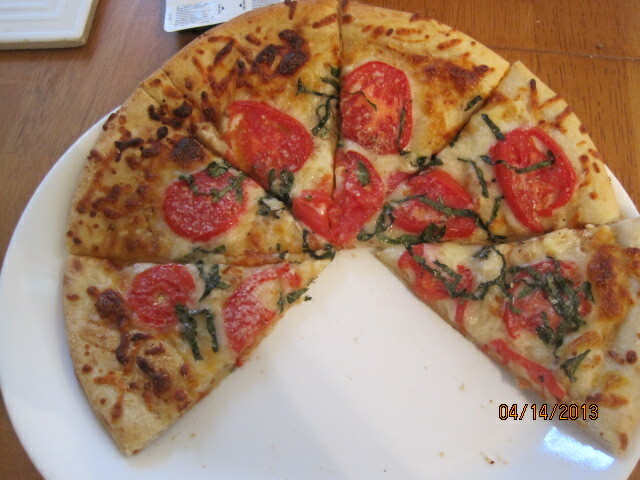 I used Boboli crust since one, I had some on hand, and two, I don’t usually make my own pizza dough. You could easily substitute your own pizza dough or any store-bought dough in this recipe if that is what you prefer. I also put mine on a pizza stone in the oven and I really think it makes a big difference. The crust comes out much crisper, which I personally prefer. We also made a sausage pizza to go along with this one and had a side salad to round out the meal. You can’t get much simpler than that and it does taste great. The fresh tomatoes, the olive oil, the garlic and fresh basil really made it for me. I just love the smell of fresh basil and the kitchen smelled great while it was cooking. Using a really good olive oil seemed to make a good difference too, so if you have a good one, this is a good recipe to use it on. I do have a few recipes planned out for this week, including the one I am making tonight of indoor grilled steaks with tomato and basil and some sweet pea risotto. Check back tomorrow to see the recipes and how they came out. Until then, enjoy the rest of your day and enjoy your meal!